"Log Rafts, Washington and Oregon"
Penny Postcard, "Sea-going log raft, 8,000,000 feet of timber, Oregon, ca.1915.". Published by Lipschuetz & Katz, Portland, Oregon. Divided back. Card #269. In the private collection of Lyn Topinka. 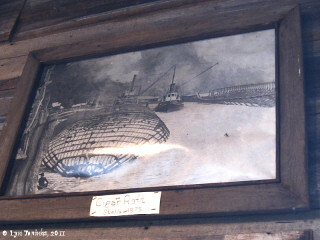 Click image to enlarge Photo, "Cigar Raft" at Stella, Stella Historical Society Museum, Stella, Washington. Image taken August 7, 2011. Caption on this image in the Stella Historical Society's "History of Stella" publication (1984) says "1896 Cigar raft. Cradle on right used to assemble the 65-foot-wide, 35-foot-deep, 600-foot-long raft. The ocean-going raft contained five million board feet of lumber. Made at Stella." 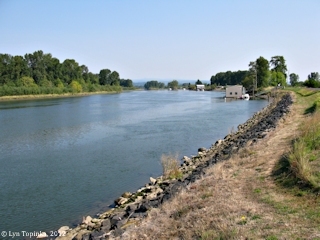 Click image to enlarge Shipping logs, Columbia River, view from Hammond Mooring Basin, Hammond, Oregon. Image taken August 13, 2013. Penny Postcard, ca.1915, "Cradle of an Ocean-going Log Raft, Oregon." Caption on back reads: "The heavy logs from the Oregon forest, being too large for transportation by boat or rail, immense rafts are constructed as shown in this picture, and are "towed" down the coast to California saw mills." Divided back, Published by Portland Post Card Co., Portland, Oregon. #P1118. In the private collection of Lyn Topinka. Log rafts made at Stella, Washington on Coal Creek Slough were piling logs, many of which still exist today in structures in San Francisco, California. The final cigar raft was made up in Coal Creek Slough at Stella (in 1921). Stern wheelers of the Shaver Transport Co. towed the monster boom downriver below Astoria where seagoing tugs took over for the thousand-mile journey to San Francisco. Pilings from that load still support piers and terminals from Fisherman's Wharf to the Embarcadero. These colossal rafts in their heyday contained eight million board feet of wood, enough to supply a modest sized sawmill for a year. The Robertson Raft Company, the team of Robertson and Bain, built cigar rafts in Coal Creek Slough as early as 1895. Their first small raft broke at sea. Bain left the business, but Robertson tried again the next year, with success. It was sheer size and three-inch chains that finally made the cigar raft work. It was much like building a ship. The raft began taking form in a huge wooden cradle shaped like the bottom of a ship. The logs were hoisted by cranes powered by small donkey engines. These cranes had 110-foot swing booms which carefully piled the logs in layers, taking care to overlap them precisely so that the structure of the raft itself would contribute to its strength. At the bow end a great steel prow was anchored by a huge center chain which ran from one end of the raft to the other. Side bracing was accomplished by cross wires and wrapper chains. The chain links were as big around as a man's wrist. The rafts made at Stella were piling, Benson's rafts, made on the Oregon side, were saw logs only. Hammond Company made rafts at Stella. The shape of the rafts made it possible to tow them from either end. At times, during a storm at sea, the raft would be cut loose to roll and then be picked up again after the storm was over. ..."
Source: Stella Historical Society, 1984, "History of Stella", vol.1, excerpt written by Lester Howard. Hammond continued to acquire timberlands, primarily in the Tillamook forest and along the North Santiam River. With his connections to the Southern Pacific, he bought 95,000 acres from the railroad, making him one of the largest private owners of timber in Oregon. Hammond purchased mills along the North Santiam in 1899 and the Hume mill in Astoria in 1908, which burned down in 1922. To haul raw logs to market in California, he partnered with Captain Hugh Robertson to establish the Oregon Rafting Company in 1901. Over the next twenty years, until Congress outlawed the practice as a hazard to navigation, Hammond used his fleet of steam schooners to tow massive cigar rafts of logs from the Columbia River to San Francisco." Source: Oregon Encyclopedia website, 2011, "Andrew B. Hammond." 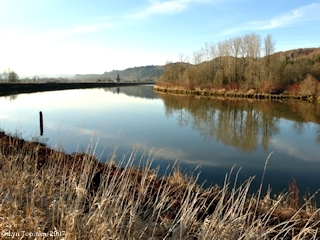 Click image to enlarge Coal Creek Slough, Willow Grove, Washington. Image taken January 28, 2007. 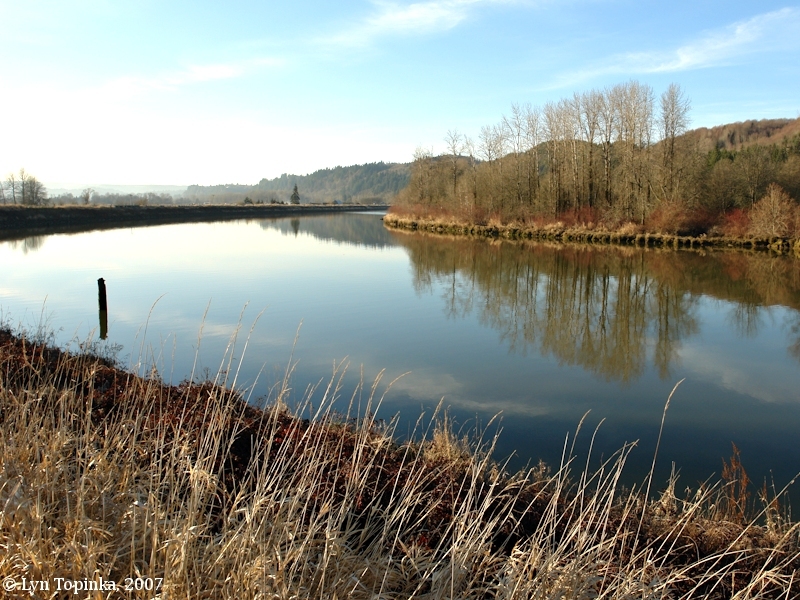 Click image to enlarge Looking down Coal Creek Slough towards Stella, Washington. Image taken May 19, 2014. 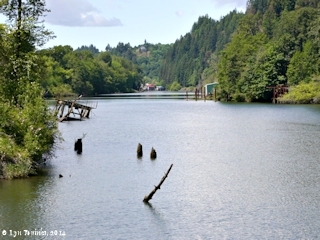 Log rafts made along Wallace Slough, Oregon were made of logs destined for the sawmills of San Diego, California, and were known as "Benson Rafts" after logging tycoon Simon Benson. "... photograph of men posing atop a “Benson raft” was originally sold as a stereograph by Underwood & Underwood, a stereographic distributing company, established in 1882. Stereographic cards contained two identical images side by side and were looked at through special spectacles, creating a three-dimensional effect for viewers. According to the accompanying text, the photograph dates to 1902. However, the photograph is likely misdated, since rafts of this size were not yet built until 1906. Log rafts like the one pictured here were first developed in 1906 by Simon Benson, a Portland-based timber magnate. Although Benson was not the first timberman to transport his company’s logs to market by rafting them together, he was the first to develop an ocean-worthy raft that could dependably transport “millions of feet” at a time. Determined to find a way to profit from the high demand for lumber in the booming city of San Diego, California, Benson developed his log rafts so that he could circumvent the high costs of railroad and/or ocean barge transportation along the Pacific Coast. 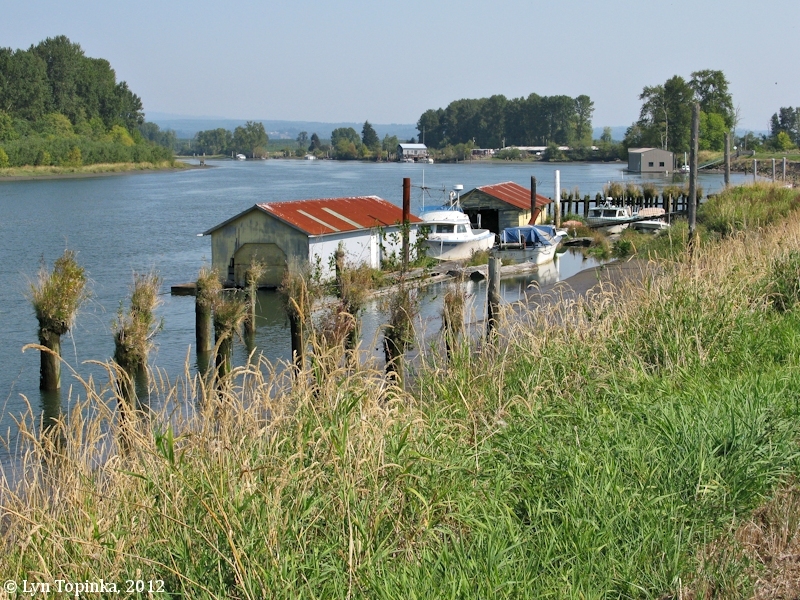 After working out his own design, he hired John A. Festabend to supervise construction of the cigar-shaped rafts, which were assembled in the calm waters of the Wallace Slough, near Clatskanie. Raft construction began with the building of a floating wooden “cradle,” which slightly resembled the wooden frame of a large sailing ship. A floating derrick then lifted logs into the cradle over a period of four to seven weeks. Although logs of all sizes were transported, a large volume of tree-length logs were included in the raft to give it strength and stability in its voyage across the Columbia River bar and in the open ocean. Enormous chains were also used to lash the raft together, with one running lengthwise through the center, some encircling the raft approximately every fifteen to twenty feet, and still more attaching the chains to each other at strategic points throughout the raft. When a raft was complete, one side of the cradle was removed and the raft was “kicked out.” Once free-floating, rafts would “flatten out” in the water, further tightening the circle chains and making them even stronger. Most rafts hauled approximately 4 to 6 million feet of logs and were typically about 800 to 1000 feet long, 55 feet wide, and 35 feet thick from top to bottom—usually drafting 26 to 28 feet deep. Holding them together was anywhere from 175 to 250 tons of chain. Benson’s rafts were transported the 1,100 miles to San Diego during the summer, arriving at his saw mill roughly 15 days after leaving Clatskanie. The rafts were a huge success. Between 1906 and 1941, 120 Benson rafts were sent to San Diego from the Columbia River, with only 4 being lost by ocean storm or fire. More than half the time, the rafts were “deck loaded” with processed lumber like shingles, fence posts, poles and spurs to maximize profits. Even so, Simon Benson quickly outgrew the business venture and sold all of his holdings in Clatskanie and San Diego between 1909 and 1911." Source: Oregon History Project website, 2011. Click image to enlarge Wallace Slough, looking east, Oregon. Wallace Island is on the left. Image taken September 17, 2012. The Stella Historical Society identifies this image as being from Stella, Washington. The rafts at Stella were assembled in Coal Creek Slough. Penny Postcard, Postmarked 1906, "Log Raft, Columbia River -- 7,000,000 Feet of Lumber.". Published by D.M. Averill & Co., Portland, Oregon. Undivided back. Card is postmarked November 21, 1906. Card #515. In the private collection of Lyn Topinka. Penny Postcard, Postmarked 1909, "Towing Log Raft from Columbia River to Pacific Ocean.". Published by The Portland Post Card Co., Portland, Oregon. Made in Germany. Card is postmarked March 1909. Card #119. In the private collection of Lyn Topinka. Penny Postcard. Photo card, undivided back. No other information on card. In the private collection of Lyn Topinka. Penny Postcard. Photo card, divided back, white edges. No other information on card. In the private collection of Lyn Topinka. Penny Postcard, ca.1915, "Log Rafts of five million feet each, 900 feet long, depth 28 feet below Waterline, San Diego, Cal." Divided back, Panama-California Exposition, San Diego, published by Eno & Matteson, San Diego. Made in U.S.A. In the private collection of Lyn Topinka.